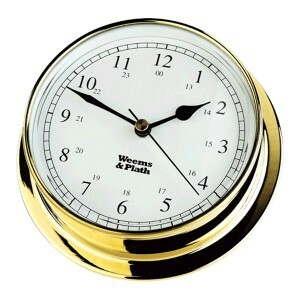 Light, strong and durable, the Endurance II Quartz Clock in brass finish features a traditional fron..
Light, strong and durable, the Endurance II Open Dial Barometer in brass finish is a holosteric or a.. These instruments have brass cases with super durable, tarnish-free coating and QuickFix fitting sys..
Organic glass.Porthole opening.High sensitivity aneroid barometer, with an entirely metallic chain.D.. The Riviera instruments have heavy solid brass cast casings, opening portholes with bevelled glass f.. The movements from our popular Cockpit Clock and Barometer set on an adjustable plinth within a poli..